The Utilikilt is a modern interpretation of the classic Scottish vesture. 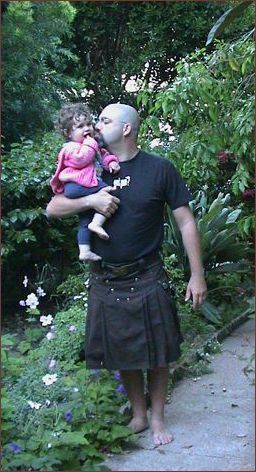 Comfortable, as no bifurcated pants could possible be, this modern kilt is functional, stylish, modest, and sturdy. Here's my review of this interesting garment. Made with a pleat pattern that doesn't lend itself to use with tartans (the horizontal lines won't line up), the Utilikilt is offered in solid colors and irregular patterns. The Workman's uses a heavyweight duck; other styles are a bit lighter. Cargo pants are a favorite of mine, and the Utilikilt gives them a run for the money. Two ample pockets on the rear are sufficient for most uses, but the two large cargo pockets, one on each side, dramatically increase the carrying capacity of the garment. The latter are divided with stitching so you can properly store tools. There's a hammer loop which'll hold a full-size drill. And, as you can see, it's not a mini-skirt. Nothing to worry about when one bends over. In fact, it's pretty easy to keep the family jewels properly stowed in most positions, although I'd recommend against doing cartwheels. Nothing to see here, folks. Move along.